Premier Houseboats are pleased to present Two's Wild, an extremely well maintained Mirage 29, fully equipped and ready to sail. Two's Wild offers surprising space, with a double and two single berths in the main saloon, together with a V berth in a separate cabin. 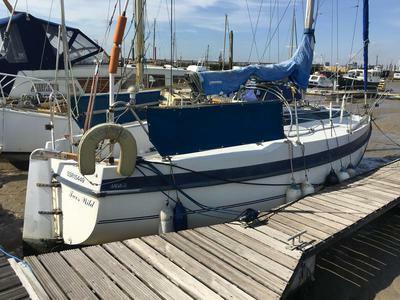 There is a cosy galley with sink, fridge and gas oven and hob, and also a separate toilet and shower compartment. There is a Rinnai gas hot water heater, and a Plana 2 kw hot air heater. The upholstery is in excellent condition throughout, and there is also good storage. The list of equipment is impressive, including Rutland wind generator and repeater, Raytheon GPS, 2 Raymarina auto helms, vhf radio, Adverc battery management, Solaris solar panels and an electric windlass. There are also two main sails, 2 Genoa's, one spinnaker and one storm gib. Vessel name: Two's Wild Vessel condition: Good Designer: Les wakefield Builder: Boating Scene LTD Make: Mirage Model: 29 Year constructed: 1984 Berths: 6 Cabins: 2 No. of engines: 1 Engine model: volvo penta Engine power: 18 Fuel type: Diesel Length over all: 29' 1" Beam: 10' 6" Maximum draft: 3' 9" Hull material: Glass Fibre Hull type: Displacement Keel type: Twin Keel Disclaimer Premier Houseboats offers the details of this advert in good faith as it was presented by the seller or his representative but cannot guarantee or warrant the accuracy of this information nor warrant the condition of the described item within this advert. A buyer should instruct his agents, or his surveyors, to investigate such details as the buyer desires validated. The Item described within this advert is offered subject to prior sale, price change, or withdrawal without notice.